Mike Neil and Jordan Tracey scored unassisted goals and Matt Robichaud posted his third shut out in four games as the SK Knights blanked the Fairville Shooters Alpines 2-0 in Game Four of the Lancaster Centennial Hockey League Championship Finals on Thursday evening at the Peter Murray Arena. The Knights win the best of seven series four games to none surrending a single goal to the Alpines in Game Two for the series sweep. Chad Snyder scored two goals and added an assist and Matt Robichaud posted his second shut out of the Finals leading the SK Knights to a 3-0 win and a stranglehold three games to none lead in the Lancaster Centennial Hockey League Championship Finals on Sunday evening at the Peter Murray Arena. Scott McMillan also scored for the Knights against Alpines goaltender Mike Langteigne. 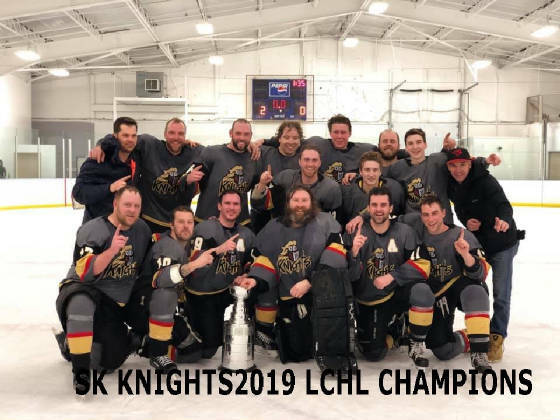 Chad Snyder and Keenan Wedge-Joudrey each scored a goal and added an assist leading the SK Knights to a 4-1 win over the Fairville Shooters Alpines in Game Two of the Lancaster Centennial Hockey League Championship Finals on Friday evening at the Peter Murray Arena. Liam Carruthers and Chris Melanson also scored for the Knights against Alpines goaltender Mike Langteigne. Jay Blanchard scored a power play marker at 5:35 of the 2nd period for the only score against Knights goaltender Matt Robichaud. Mike Neil scored a power play goal at 8:59 of the 3rd period and Matt Robichaud posted the shut out as the SK Knights edged the Fairville Shooters Alpines 1-0 in the opening game of the Lancaster Centennial Hockey League Championship Finals on Thursday evening at the Peter Murray Arena. The Alpines were handed a too many men on the ice minor penalty at 7:46 and 73 seconds later Neil scored on Alpines goaltender Mike Langteigne to secure the first game in the best of seven finals series.